This is the limited edition pressed on "crystal clear" vinyl. 2,000 copies were produced, each copy is individually foil-numbered on the rear sleeve in silver or gold. "Music On Vinyl®. 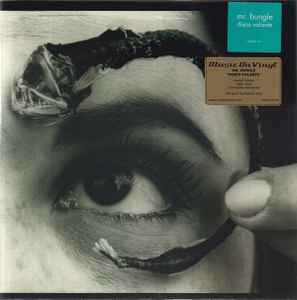 Mr. Bungle "Disco Volante". Limited edition. Clear vinyl. Individually numbered. 180 gram audiophile vinyl. www.musiconvinyl.com MOVLP1135". There is a jade coloured sticker affixed directly onto the front cover that reads "Mr. Bungle Disco Volante MOVLP1135". The sticker is the same colour as the sticker on the cover of the original Warner Bros. Records pressing of the album. Originally released ℗ & ©1995 Warner Bros. Records Inc. This release ℗ & © 2014 Warner Music: manufactured & distributed by Music On Vinyl B.V. for Warner Music. All songs ©1995 Beat Me Up, Lord Music (ASCAP). Recorded at Brilliant Studios, Hyde Street Studios, Coast Recorders and Shotwell Bomb Factory, San Francisco: and Mills College Concert Hall, Oakland. Mixed at Soundcastle, Silverlake, CA. and Different Fur, San Francisco. Mastered by Bernie Grundman, Los Angeles. Management: Kirsten Yee Management, 1401 Sanborn Ave., Los Angeles, CA 90027. The tracks are listed sequentially from 1 to 11 on the printed insert, they are not numbered on the sleeve. Durations for all tracks apart from "The Secret Song" are printed on the record's face labels. Anyone have a sound issue on Violenza Domestica on the MOV clear vinyl? I have some kind of clicking / surface noise through most of the track, wondering if other copies have that problem. Great sound quality even though it's missing Platypus.